October 28, 1988. From the Oregon-Idaho state line to its confluence with the Owyhee River. Wild — 9.6 miles; Total — 9.6 miles. The North Fork of the Owyhee River is a tributary of the Owyhee River and is located in Malheur County, Oregon, and Owyhee County, Idaho. Its source is on the east flank of the Owyhee Mountains in Idaho, and it flows generally southwest to meet the main stem Owyhee at Three Forks, Oregon. 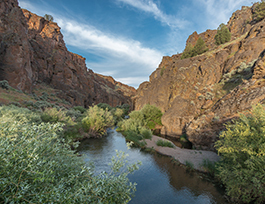 The nine-mile (14.5 km) segment in Oregon, which flows from the Idaho-Oregon border to the main stem Owyhee River, was designated in 1988 and classified as "wild." The North Fork flows through a deep canyon rimmed with basalt. The North Fork of the Owyhee River offers very high-quality backpacking opportunities and excellent early season kayaking for experts on the 12-mile section between North Fork Crossing and Three Forks. Hunting, camping and wildlife viewing are available in this area. This designated river corridor contains a subtle diversity of land forms and vegetation. Interesting erosional patterns and colorful rock strata mix with large stands of juniper. Canyon bottoms are overshadowed by steep, rugged canyon walls. Two notable side canyons laced with juniper trees add complexity to the landscape, and the remoteness and solitude found here contribute to the scenic value. A community of western juniper provides hiding and thermal cover for wildlife. Mule deer make use of the North Fork Canyon as a migration corridor to wintering ranges in the main Owyhee Canyon. Other species include cougar, pronghorn antelope and white tailed jackrabbit. The abundance of small mammals on the plateau contributes to the large and diverse population of raptors. Numerous bird species utilize the junipers throughout the year. It is common to see the threatened sage grouse, as well as a number of nongame birds.